In order to pro-actively promote exports of Taiwan agricultural products to Japan, the Council of Agriculture (COA) guided local governments and farmers’ groups from Taoyuan City, Yunlin County, Chiayi City, Tainan City, Kaohsiung City, and Pingtung County to organize a group to participate in FOODEX JAPAN 2018, held in Japan from March 6 through 9 of this year (2018). COA Minister Lin Tsung-hsien not only personally led the group in participating in the exhibition, he also invited the outstanding baseball player Yang Dai-kang, a Taiwanese who is playing professionally in Japan, to serve as spokesperson at the pre-FOODEX “Press Conference on Cooperation Between the Food Products Industries in Taiwan and Japan,” held on March 5, where he promoted premium agriproducts from Taiwan to Japanese baseball fans and consumers, and strongly marketed Taiwan jujube. Jujube is highly nutritious (with Vitamin B having the highest content in the fruit), as well as crunchy and juicy, with an excellent texture, and is known by the lovely name “Taiwan apple.” In December of 2016 Japan agreed to allow imports of fresh Taiwanese jujube after undergoing low-temperature phytosanitary insect-killing treatment. In coordination with FOODEX JAPAN 2018, COA Minister Lin, along with Yang Dai-kang, introduced and promoted Taiwanese agriproducts—including Taiwan jujube, allowed to be exported to Japan for the first time—to Japanese media, sales-channel businesses, and consumers at the pre-FOODEX “Press Conference on Cooperation Between the Food Products Industries in Taiwan and Japan,” held on March 5. Minister Lin also specially participated in a consumer taste-testing activity held at the Ebina Service Area of the Central Nippon Expressway, hoping to use the popularity and high traffic volume of the Service Area to enable even more Japanese consumers and international travelers to try delicious Taiwan agriproducts. 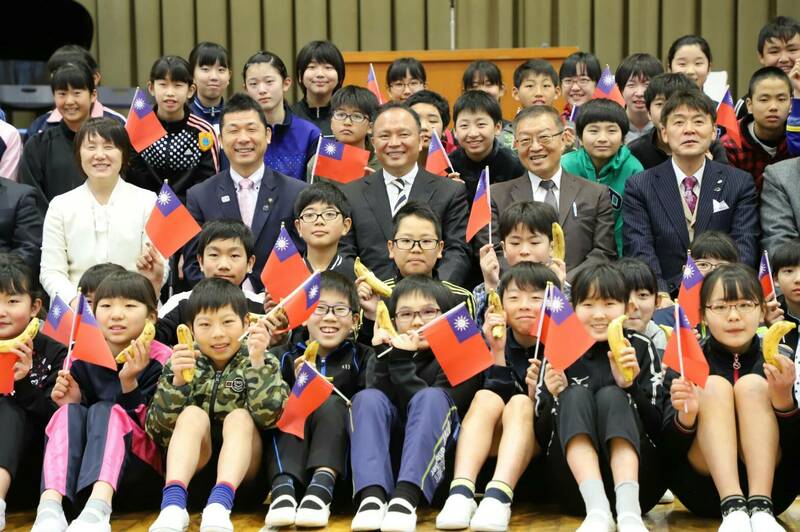 The COA relates that in 2016 local Japanese enterprises facilitated the purchase of Taiwan bananas on numerous occasions by Gotemba City of Shizuoka Prefecture to provide to students as the fruit portion of a healthy lunch, and also for use at that city’s sports day activities, enabling Japanese primary school students to get to know agriproducts produced in Taiwan. 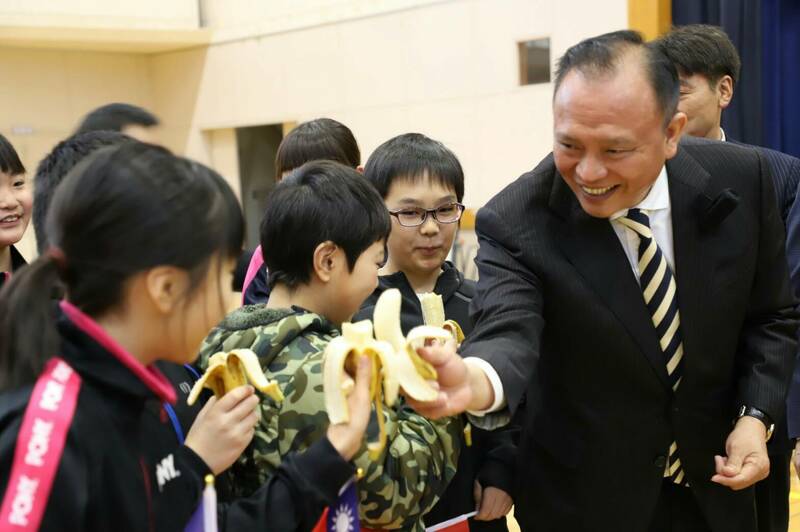 Taiwan bananas were once the favorite fruit of now-elderly Japanese, and Minister Lin specially utilized this visit to Japan to go to the Harasato Elementary School in Gotemba City to give out Taiwan bananas, and together with the students enjoyed the taste of this fruit, hoping to give Japanese students the chance to experience the sweetness, aroma, and gummy texture of Taiwan bananas that their grandparents so enjoyed. The COA has already set “Promoting Taiwan premium agricultural and fisheries products as foods for the 2020 Tokyo Olympics” as a primary policy goal, and has already studied in detail the contents of the draft “Sustainable Sourcing Code” issued by the Tokyo Organising Committee of the Olympic and Paralympic Games. The COA points out that Taiwan’s government has already adopted a number of certification labels for agricultural and fisheries products, including traceability, CAS, and organic certifications, through which consumers can trace the complete production process and source of agriproducts, and Taiwan also participates in major international ecological labeling systems or sustainable fisheries promotion and certification systems, such as certification from the Aquaculture Stewardship Council for Taiwan tilapia, and dolphin fish (also known as mahi mahi) under the Fishery Improvement Project. Minister Lin took advantage of this trip to Japan to pro-actively try to win the inclusion of Taiwan agriproducts in the food purchases for the 2020 Tokyo Olympics, hoping to promote Taiwan premium agriproducts to the international community and enable competitors and travelers from around the world to enjoy the delicious flavors of Taiwan agriculture.